Happiness is a lot like rain. When there’s a drought, the notion of a downpour seems remote yet, when the windows of sunshine open up, they give forth so much light that the idea of being left high and dry becomes laughable. We appreciate the rain for the rainbows it bestows. Rainbows are the sunbeams of life. In fact, we can appreciate them so much that we are willing to endure the downpour that gives rise to them. Music elevates us much like a rainbow. The color of music soothes the soul, inspires the mind, and unlocks the heart wide open. Its’ compositions and rhythms give way for inner peace to commence so that we can see the brighter side of life’s challenges. The best things in life are truly worth waiting for, hoping for, and living for. Those things are full of color and anticipative contentment and we accept that they require precious time. They cannot be hurried. The hanging about and the hoping is all a part of the pleasure. So too, is the uncertainty. Without any real element of doubt, there can be no genuine experience of liberation, optimism, or reassurance. The possibilities of all things bright, good, and divine are what keep us focused on the journey. Lyrics like Marley’s contain messages of resilience, courage, and reinforcement. We dare resist them because they prompt us to upsurge our sense of faith and have stronger beliefs in the goodness of life – for there is goodness in life. Sometimes we wonder if the composers of these songs can see with their very own eyes just how full this world is with troublesome things. Of course they can and the expected results from their optimism are confronted all the same. Every challenge in life is a potential teacher. An uncertain or confusing situation is an opportunity to practice mindfulness and difficult people and circumstances provide us with those enlightening opportunities to display the highest levels of gentleness and empathy. We will meet disappointments each day of our lives and even too, we will have great expectations about things, unfulfilled wishes, unexpected arrivals and yes, necessary departures. Sometimes our priorities will be met. At other times, our plans will be blocked by circumstances. Once we stop worrying and allow the rain to pour we can welcome the rainbow that is sure to bring hopefulness and peace. Going through a difficult situation is the only way to arrive at an outcome that is much desired, and one that generates a long-lasting glow of delight, relief, and inspiration. So, how do you find a pot of gold at the end of a rainbow? You continue traveling in the direction in which you last saw the rainbow’s end. Will you ever reach a point where you find a stick, protruding from the ground, marked by a little flag that says, “The rainbow end is right here, start digging?” Not necessarily, but somewhere on the journey you will meet someone or something that opens up your eyes to the possibilities – of everything possible. 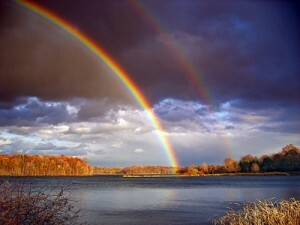 It is in the chasing of the rainbow that the magic of life is always found. Be hopeful. The dust is settling. The sun is rising. Weekly Affirmation: I am blooming into my full potential. 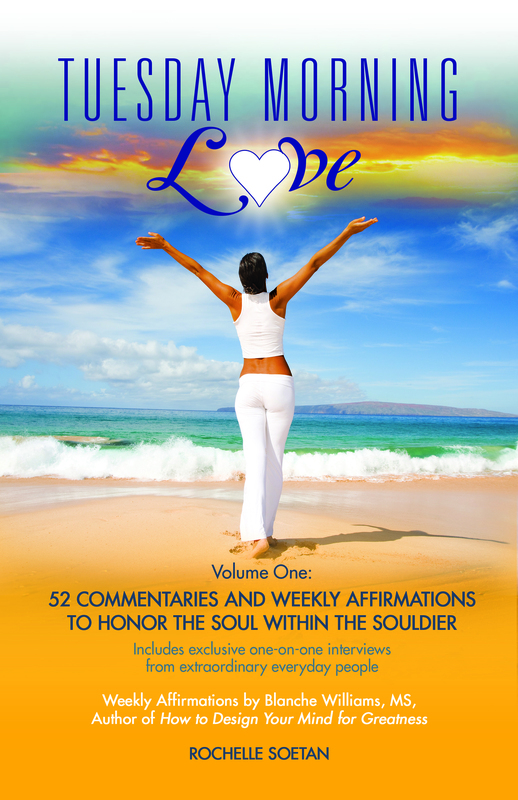 Tuesday Morning Love: 52 Commentaries and Weekly Affirmations to Honor the Soul Within the Souldier (edited edition) will soon again be available in eBook and Paperback. We regret the delay. Thank you for your patience and continued support. Stewart, thank you for stopping by! I have been blogging for six years – writing for 34. So glad you’re here. Keep reading…and share the love!